If you can’t get your kids to have a hearty breakfast, don’t worry. Make them a Breakfast Ice Cream packed with Super Foods! They will be jumping with good energy that will last all day! This powerful breakfast-dessert can be for the entire family. [recipe notes] When making it for adults, you can add your favorite powders, protein, maca, spirulina, super green food, etc. 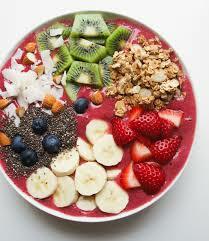 Blended frozen fruit of your choice and topped with fresh fruit, nuts and seeds. 1 cup frozen strawberries (or , raspberries, blueberries, etc) You can use your favorite fruit or combination of it. Mix well in a food processor or in a high speed blender. Serve in a small bowl with toppings.